Create a Podfile and add pod 'WootricSDK'. This will download and install the latest version of the SDK. If you want to you can specify which version of the SDK by doing something like this pod 'WootricSDK', '0.5.6'. For more information about creating this file, please refer to Cocoapod’s Podfile Guide. On your terminal, and inside your project’s directory, run $ pod install. Cocoapods will download all dependencies specified in your Podfile. From now on, you should use the .xcworkspace file instead of the .xcodeproject file. If you haven’t already, install the latest version of Carthage. Add github "Wootric/WootricSDK-iOS" to your Cartfile, and follow the Carthage installation instructions. In the future, to update to the latest version of the SDK, run carthage update --platform ios. // TODO: Required to uniquely identify a user. Email is recommended but this can be any unique identifier. // TODO: The current logged in user's sign-up date as a Unix timestamp. First import the SDK into your ViewController of choosing. Then configure the SDK with your client ID and account token. Sign in at wootric.com if you haven’t already. 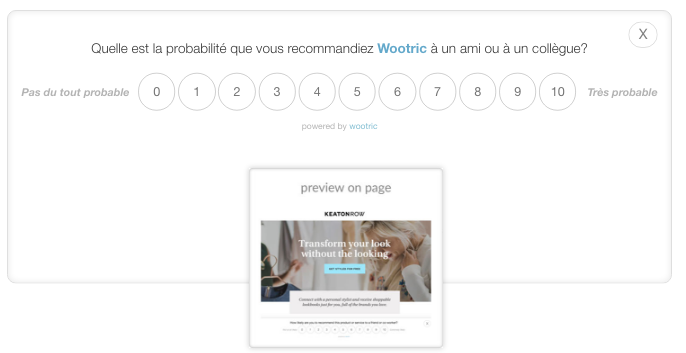 If you just signed up on the Wootric homepage, you will be taken directly to an installation page. If you’re a returning visitor, click on the “Settings" button near the top right of the page. Navigate to the Wootric Installation Guide and you will see a unique account_token for you to use. The client_id can be found on your account’s settings API section. 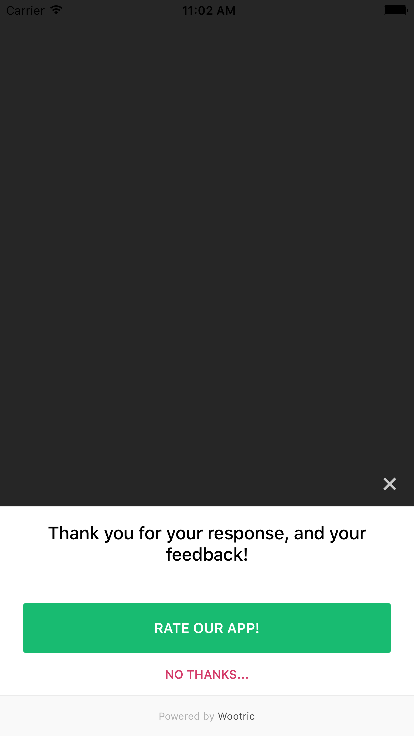 To display the survey just use showSurveyInViewController. If the user is eligible (this check is built in the method) the SDK will show the survey. Comment out the line [Wootric forceSurvey:YES] or Wootric.forceSurvey(true) when you are ready for production. Alternatively, leave the line in the code for testing purposes or to survey the customer upon every visit to a view. This is an important step! Customize your survey with the name of your product or company. As needed, make changes to our trusted survey and sampling defaults. This values can modified from your app. Step 3. View your Responses Live! That’s it! Once the WootricSDK is installed, eligible users will immediately start being surveyed. 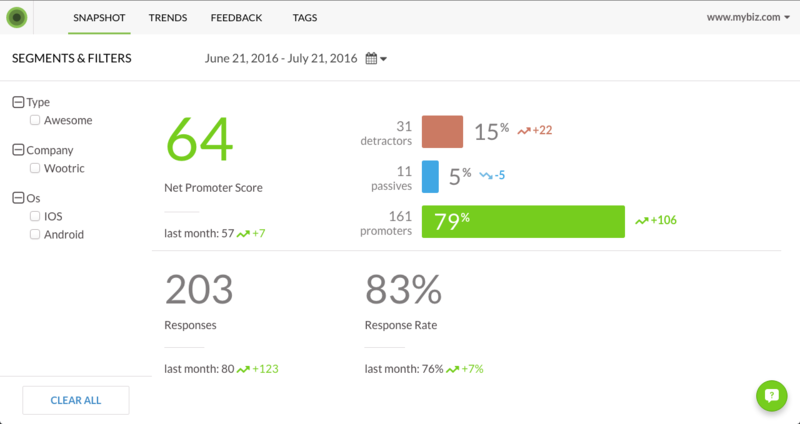 Depending on the traffic of your app, you could start to see responses within a few minutes. Responses will come in to your Wootric dash in real time. For a working implementation of the iOS WootricSDK, try the demo app on our Github repo. 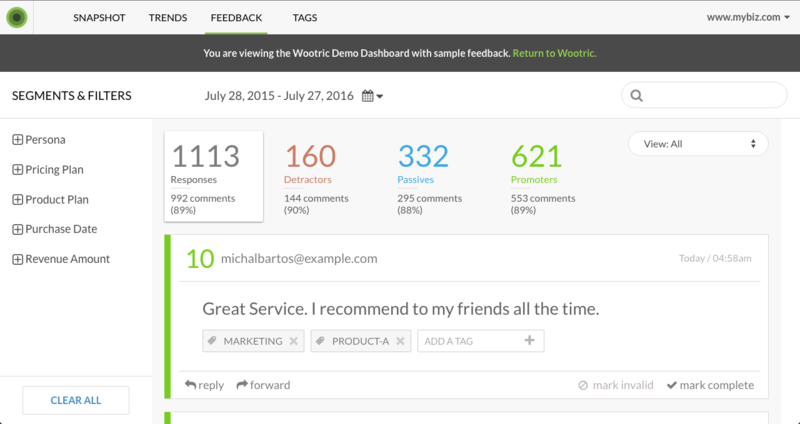 Checkout the Demo dashboard with dummy data. I’d like to do some testing first. How do I ensure that the survey shows up on demand? You can easily install Wootric in your development environment for testing. The SDK is already set up to show the survey immediately for testing purposes only. If your app has registered users, we recommend that you show the survey only on views that your logged in users will access to allow unique user identification. If your app has a checkout flow, we recommend that you show the survey on views that won’t interrupt checkout. The most commonly used location is the transaction completion page. While end user email is not required it is HIGHLY recommended to set it if possible. Set an external ID for the end user. This value is optional. If forceSurvey is set to true, the survey is displayed skipping eligibility check AND even if user was already surveyed. This is for test purposes only as it will display the survey every time and for every user. If surveyImmediately is set to true and user wasn’t surveyed yet - eligibility check will return true and survey will be displayed. This should not be used in production. When creating a new end user for survey, it will set the external creation date (so for example, date, when end user was created in your iOS application). This value is also used in eligibility check, to determine if end user should be surveyed. If not set, defaults to value from admin panel. Used to check if end user was created/last seen earlier than ago and therefore if survey is required. End user properties can be provided as an NSDictionary object. Directly adds a product name to end user’s properties. Right after a vote or dismiss we are setting a NSUserDefault that lasts for 90 days and indicates that end user was already surveyed on this device. We are doing this to lower the requests amount to our eligibility server. If your survey throttle is different than 90 days and/or you don’t want to set the surveyed “cookie” you can set this option to NO. With this option enabled, promoters (score 9-10) will be taken directly to third (social share) screen, skipping the second (feedback) one. If showOptOut is set to YES, it will show an option for the end user to opt out of being surveyed. Default value is NO. Set WTRLogger level to None i.e. it won’t show any log from the WootricSDK. Set WTRLogger level to Error i.e. it will only show error logs from the WootricSDK. Set WTRLogger level to Verbose i.e. it will show all logs from the WootricSDK. While Wootric is using values you have set in admin panel, it is possible to override these values directly in code. Changes NPS Question from admin panel to provided value (English default is “How likely are you to recommend this product or service to a friend or co-worker?”). Changes final thank you from admin panel to provided value (English default is “Thank you for your response, and your feedback!). // You can pass nil value for any of the parameters - it will use defaults for eligibility check if you do so. This method will alter the values of resurvey throttle, tested visitor, registered users percentage and daily response cap used for eligibility check. This method allows you to set custom question for each type of end user (detractor, passive or promoter). Passing nil for any of the parameters will result in using defaults set in Wootric’s admin panel for that type of end user. Same as with custom question, it allows you to set custom placeholder text in feedback text view for each type of end user. Be advised that this setting takes precedence over values set in Wootric’s from admin panel. Please refer to our docs for available languages. 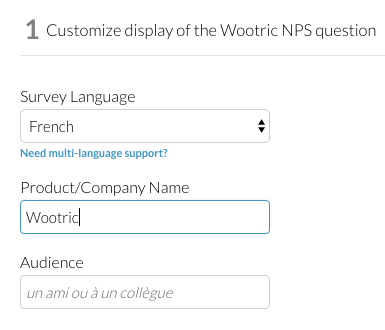 Custom audience and/or product name modifies the default NPS question e.g. default question in English looks like this: “How likely are you to recommend this product or service to a friend or co-worker?” if custom product name is set it will substitute “this product or service” text, while custom audience will substitute “friend or co-worker”. It also takes precedence over values set in admin panel. If configured, social share will display third screen for promoters (score 9-10, also twitter displays only if there is a feedback text provided), while custom thank you message and/or button will display for each type of end user that is configured (where setThankYouMessage: and setThankYouLinkWithText:URL: being default for any score). For detailed information please refer to js docs. Appereance of the survey can be modified to match your apps colors. The survey slider, Send button, Thank You button and all social sharing buttons can be modified. First survey after & end user created at setting: While it is not required, setting setEndUserCreatedAt is highly recommended for proper checking if end user needs survey and skipping uneccessary eligibility checks. // Replace YOUR_APP_ID with your application's id. You can set the last button to go to the App Store so users can rate your app. // Integer representing the date (Unix timestamp format) of the user's last order with the key suffixed with "_date"
// Integer representing the user's total purchases with the key suffixed with "_amount"
Setting end user properties will help you segment and filter results. Wootric currently supports Integers, Strings, and Unix formatted dates as values. Integers must be suffixed with _amount and dates must be in Unix timestamp format and suffixed with _date. Keys cannot contain characters such as ‘$’, ‘.’ or the NULL character. Values cannot be nested hashes or arrays. Survey not showing up or is blank? Wootric provides an integration for Segment. The library can be found on our Github. First of all you need to provide values for account token and clientID in Segment’s dashboard for Wootric integration, then import Segment-Wootric. Then init the Analytics with Wootric integration. Wootric integration responds to identify call, to read more about it, visit Segment identify method documentation. In identify call traits dictionary is set as endUserProperties in WootricSDK, except keys email and createdAt which are set as endUserEmail and endUserCreatedAt respectively. For custom configuration you can use SEGWootric class instance, to get it, call: [WTRWootricIntegration wootric] For all available methods (being instace methods for SEGWootric instead of class methods) please refer to WootricSDK docs. Finally to show the survey with showSurveyInViewController. Wootric provides an integration for mParticle. Instructions on how to setup the mParticle Apple SDK can be found on mParticle’s Github.